Amazing spec Edision OS mio 4K in stock only £139! Exceptional blindscan capabilities! Thread: Amazing spec Edision OS mio 4K in stock only £139! Exceptional blindscan capabilities! 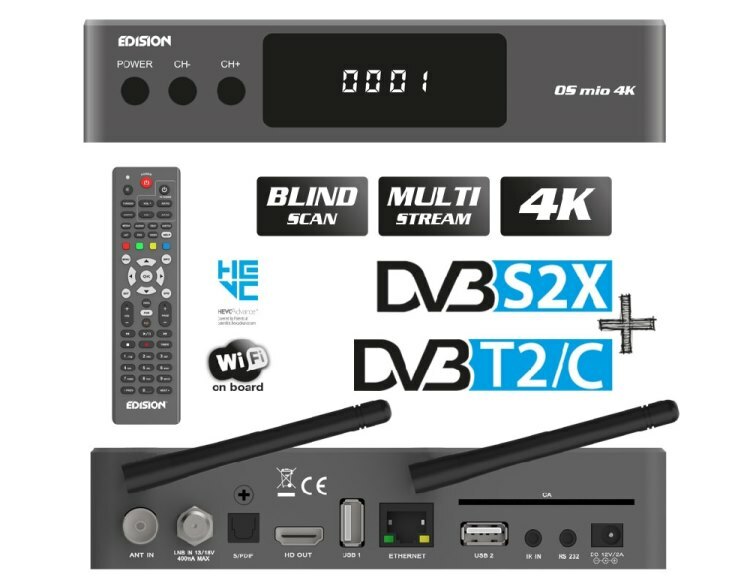 EDISION OS MIO 4K IN STOCK ONLY £139! 1X DVB-S2X SATELLITE TUNER + 1X HYBRID DVB-C/T2 TUNER. EXCELLENT TUNER SENSITIVITY WITH EXCEPTIONAL BLINDSCAN CAPABILITIES. 4K UHD WITH H.265 HEVC SUPPORT. QUALITY ALUMINIUM TOPPED REMOTE CONTROL. UNIVERSAL LEARNER REMOTE CONTROL, CONTROL POWER AND VOLUME TO YOUR TV. EXTERNAL IR SENSOR INCLUDED, EASILY HIDE BEHIND A TV OR IN A CABINET. BUILT IN DUAL BAND WiFi 2.4GHz / 5.0GHz. DUAL CORE BROADCOM CPU 1.5GHZ. 2GB DDR4 RAM + 8GB eMMC FLASH. LOW COST EUROPEAN SHIPPING RATES TO REPUBLIC OF IRELAND, BELGIUM, DENMARK, FRANCE, GERMANY, LUXEMBOURG, NETHERLANDS, POLAND, SPAIN AND MORE! If your Country is not listed in our online cart system contact us HERE.